زراعت محصول راهبردی برنج وابستگی فراوانی به وجود آب آبیاری کافی و مطمئن داشته و فشار‌های کم‌آبی، تأثیرهای جبران‌ناپذیری بر عملکرد و کیفیت محصول تولیدی دارد. این در حالی است که کاهش رواناب ورودی رودخانة سفیدرود در استان گیلان که منبع اصلی تأمین آب آبیاری برای 171 هزار هکتار از زمین‌های شالیکاری این استان بوده، عرضة کافی و مطمئن آب آبیاری را در بسیاری از مناطق این استان با چالش مواجه کرده است. 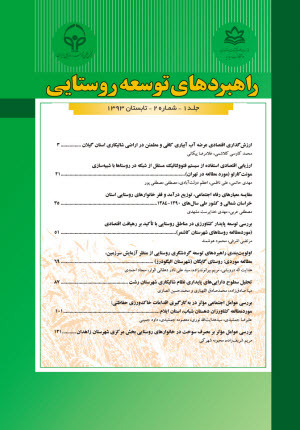 در این راستا، پژوهش حاضر به‌منظور بهبود سیاست‌های مدیریت منابع آب در طرف تقاضا، به تعیین تمایل به پرداخت شالیکاران استان گیلان برای عرضة آب آبیاری کافی و مطمئن می‌پردازد. داده‌های لازم بر مبنای بررسی میدانی و به‌کارگیری اطلاعات مربوط به 224 مزرعه در روستاهای دچار کم‌آبی استان گیلان جمع‌آوری شد. در ادامه با استفاده از رهیافت ارزش‌گذاری انتها- باز و برازش الگوی توبیت به روش حداکثر در استنمائی و دومرحله‌ای هکمن، تمایل به پرداخت شالیکاران برای بهره‌مندی از آب آبیاری کافی و مطمئن سنجیده شد. نتایج حاصله نتایج به‌دست آمده نشان داد که شالیکاران در این مناطق، حاضر به پرداخت 49/26 درصد بیشتر نسبت به هزینة کنونی تأمین آب آبیاری برای بهره‌مندی از آب آبیاری کافی و مطمئن هستند. Cultivation of the strategic crop of rice highly depends to the existence of sufficient and guaranteed irrigation water, and water shortage stresses have irreparable effects on yield and quality of productions. Decrease of the Sefidrud river inflow in Guilan province which is the main source of supplying irrigation water for 171 thousand hectares under rice cropping area of this province, has been challenged sufficient and guaranteed irrigation water supply in many regions of mentioned province. Hence, in present study estimating the value that paddy farmers place on sufficient and guaranteed irrigation water supply has been considered. Economic valuation of sufficient and guaranteed irrigation water supply improves water resource management policies in demand side. Requested data set were obtained on the base of a survey and are collected from 224 paddy farms in rural regions that faced with irrigation water shortages. Then, using open-ended valuation approach and estimation of Tobit model via ML and two stages Heckman approach, eliciting paddy farmers' willingness to pay for sufficient and guaranteed irrigation water supply has been accomplished. Results revealed that farmers in investigated regions willing to pay 26.49 percent more than present costs of providing irrigation water in order to have sufficient and guaranteed irrigation water. سازمان جهاد کشاورزی استان گیلان (1390) گزارش ارزیابی خسارات و زمین‌های شالیکاری خارج‌شده از مدول آبیاری بر اثر کاهش آورد رودخانه سفیدرود. سند راهبردی توسعه بلندمدت منابع آب کشور (1382) انتشارات روابط عمومی و امور بین‌الملل شرکت مدیریت منابع آب ایران. تهران. شرکت سهامی آب منطقه­ای گیلان (1390) مطالعات یکپارچه برنامه­ریزی منابع آب حوضه آبریز رودخانه قزل­اوزن- سفیدرود. گزارش برنامه­ریزی منابع آب. Albiac J., Martínez Y. and Tapia J (2006) Water quantity and quality issues in mediterranean agriculture. In: oecd (eds) water and agriculture: sustainability, markets and policies. OCDE. Paris. Alcon F., Pedrero F., Martin-Ortega J., Arcas N., Alarcon J. J. and de Miguel M (2010) The non-market value of reclaimed waste-water for use in agriculture. Agric Res. 8: 2-21. Barakat J. and Chamberlin I (1994) The value of water supply reliability: Results of a contingent valuation survey of residential customers. Report of Calif. Urban Water Agencies. Sacramento. California. Chandrasekaran K., Devarajulu S. and Kuppannan P (2009) Farmers' willingness to pay for irrigation water: A case of tank irrigation systems in south India. 1: 5-18. Greene W (2003) Econometric analysis. New Jersey: Prentice hall. Hatton McDonald D., Morrison M. D. and Barnes M. B (2010) Willingness to pay and willingness to accept compensation for changes in urban water customer standards. Water Resource Management. 24: 3145– 3158. Hensher D., Shore N. and Train K (2005) Household's willingness to pay for water service attributes. Environ Resour Econ. 32: 509–531. Howe C. W., Smith M. G., Bennett L., Brendecke C. M., Flack J. E., Hamm R. M., Mann R., Rozaklis L. and Wunderlich K (1994) The value of water supply reliability in Urban Water Systems. J. Environ. Econ. and Manage. 26: 19–30. JICA (2010) The study on integrated water resource management for sefidrud river basin. Main Report. Marques G., Lund J. R. and Howitt R (2005) Modeling irrigated agricultural production and water use decisions under water supply uncertainty. Water Resources Research. 41: 23-41. Mesa-Jurado M. A., Martin-Ortega J., Ruto E. and Berbel J (2012) The economic value of guaranteed water supply for irrigation under scarcity conditions. Agricultural Water Management. 113: 10-18. Mitchell R. C. and Carson R. T (1989) Using Surveys to value public goods: the contingent valuation method. Resources for the Future. Washington, D. C.
Raje D. V., Dhobe P. S. and Deshpande A. W (2002) Consumer's willingness to pay more for municipal supply water: a case study. Ecol Econ. 42: 391–400. Ranjan R (2010) Factors affecting participation in spot and options markets for water. Water Resources Planning and Management. 136: 454-462. Rigby D., Alcon F. and Burtons M (2010) Supply uncertainty and the economic value of irrigation water. European review of agricultural economics. 37: 97-117. Sigelman L. and Zeng L (1999) Analyzing censored and sample-selected data with tobit and heckit models. Political Analysis. 8: 167–182. Storm H., Heckelei T. and Heidecke C (2012) Estimating irrigation water demand in moroccan draa valley using contingent valuation. environmental management. 92: 2803-2809. Tiwari D. N (1998) Determining economic value of irrigation water: comparison of willingness to pay and indirect valuation approach as a measure of sustainable use. Centre for social and economic research on the global environment university college London and university of East Anglia. Tziakis I., Pachiadakis I., Moraitakis M., Xideas K., Theologis G., Konstantinos P. and Tsagarakis P (2009) Valuing benefits from wastewater treatment and reuse using contingent valuation methodology. Desalination. 237: 117-125. Wooldridge J (2002) Econometric analysis of cross section and panel data. Cambridge: MIT Press.